Notes: The Halesowen & Bromsgrove Branch Railway (H&BBR) was incorporated on 5 July 1865 to construct a 6-mile line from Halesowen Junction on the Midland Railway (MR) Bristol & Gloucester route to form an end-on connection with the Great Western Railway (GWR) Halesowen Branch. A second branch was also authorised to make another connection with the MR near Longbridge, likewise on the Birmingham to Gloucester line. By 1870 the company had run into financial difficulties so, realising that the plans were too ambitious, an application was made to Parliament for the connection with the Midland at Bromsgrove to be abandoned; this was authorised on 1 August 1870. Building of the line had yet to begin as the H&BBR was unable to find a contractor willing to take on the financial burden of construction. On 13 July 1876 the H&BBR assumed the title of the Halesowen Railway (HR) and construction of the first section of the line began. Prior to this, on 30 July 1872 a working agreement was drawn up between the HR, GWR and MR for the two companies to operate the line jointly and for the HR to construct a station on the MR at Northfield. The completed line was inspected by the Board of Trade in August 1881 and was found to be unsatisfactory; following modifications it was passed for use in May 1882. Sadly the line did not open immediately as a dispute between the HR and the MR developed owing to the former not completing building work at the station at Northfield, as was part of the working agreement. With the dispute settled the line finally opened on 10 September 1883, over a year since it was passed for use. A celebratory public breakfast was held at the Shenstone Hotel on 1 October 1883. The GWR and MR operated the line for 50% of gross receipts for the next 20 years but by the early 1900s the HR was in financial difficulty. In 1904 the HR was declared bankrupt, and following this the company was jointly vested in the GWR and MR on 1 July 1906. The station at Rubery opened on 10 September 1883 and was constructed in a distinctly MR style which were located on the down, Halesowen direction, platform. The main building was brick-built and combined the stationmaster’s house with the offices and public facilities. The two-storey house with a pitched roof was aligned at right angles to the platform and lacked adornment, its two chimneystacks being the most prominent feature. The hipped-roofed, single-storey office and waiting room range adjoined the house. 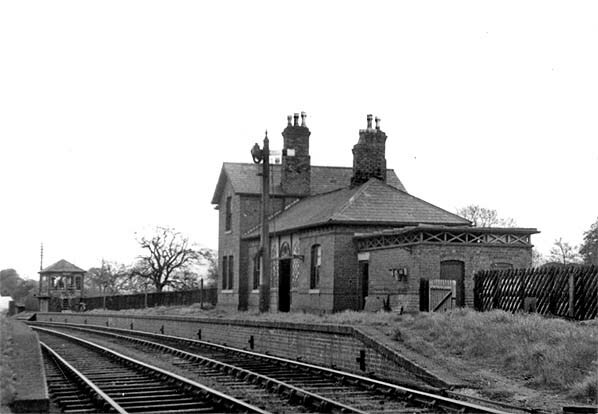 The public entrance and booking hall stood forward, adjacent to the station house, but the platform frontage was straight. Whilst the window openings of the house were rectangular, some of those on the other section were of the ‘Board School’ style with shallow segmental arches. A flat-roofed toilet and store block adjoined the office range. The up platform was a basic affair with what appears from old maps to be a waiting shelter. There also seems not to have been a footbridge provided at the station with passengers probably having to cross the line via a barrow crossing. The main purpose of the station having two platforms was to provide a passing loop midway along the branch and run-round facilities for the early passenger service, although the sparse traffic probably never warranted it. 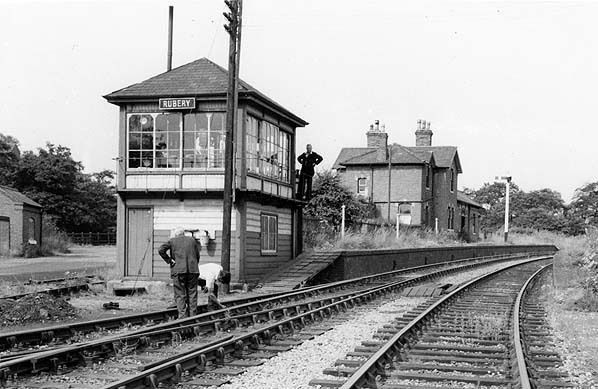 A MR pattern signal box was provided at the Longbridge end of the down platform. The new service was advertised via handbills naming it as the ‘Halesowen and Northfield Railway’. Initially there were seven services in each direction on weekdays with no Sunday trains. Of these seven, three ran from Halesowen through to King Norton, three from Halesowen to Rubery, and one service ran through to Birmingham New Street; the same was true for trains operating in the opposite direction. By December 1895, Bradshaw shows that the Halesowen to Rubery service had been discontinued but the Halesowen to Kings Norton provision had increased to five services each way on weekdays; again there was no Sunday service. 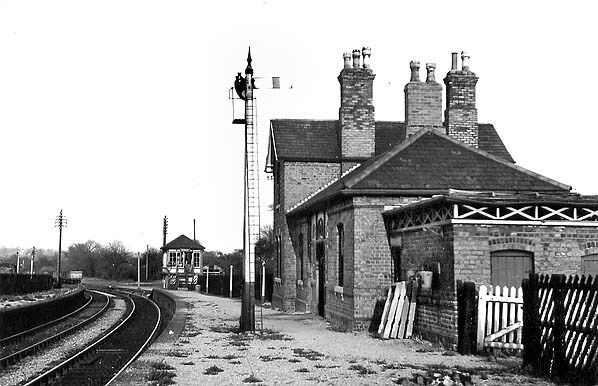 The station was provided with a small goods yard to the east of the down platform which was entered via a trailing set of points immediately prior to the signal box. To the rear of the up platform there was an extensive set of sidings used in conjunction with the quarry which was situated directly north of the station and the construction of Birmingham Corporation Water Works at Frankley reservoir. The water works branch line was authorised in 1896 and named the ‘Rubery and Frankley Railway’ and it ran for a mile north of the station. It was essentially a contractor’s standard gauge line which, at its peak, employed six locomotives. With the completion of the reservoir in around 1905 the branch line closed but remained in situ until the outbreak of the First World War when it was lifted throughout. The sidings associated with it at the station continued to be used by the quarry until around the time of closure. During the First World War Rubery played an important role acting as a reception point for ambulance trains conveying injured soldiers back from the Western Front. The casualties were then taken by road to Hollymoor and Rubery Hill hospitals. In 1905 the Austin Motor Company opened a new car plant at Longbridge. By 1913 the workforce had grown to around 2,300 employees and by the end of the First World War it had swelled to 22,000. In 1915 the first sidings were laid at the plant and the MR and GWR obviously saw the increasing workforce as a chance to increase passenger revenue along the branch. A new station was constructed in the MR style. Even with the increase in use the general passenger numbers never reached acceptable levels, and in April 1919 the MR withdrew the passenger service between Halesowen and Kings Norton. It was the GWR who introduced a daily workmen’s service each way between Old Hill and Longbridge. This unadvertised service called at Rubery and the date of the cessation of this stop is disputed with some sources quoting April 1934 as the final date whilst others give it as 29 August 1958. Photographic evidence shows that during the 1950s the weed infested down platform was cleared and gravel laid as the platform surface; this alone suggests that the workmen’s service was still making its daily stops. Although passenger services had been discontinued as early as 1919 the station was still staffed at least until the mid 1950s. Apart from the railtours, which became a feature of the line in its latter years of operation, the final documented working of a passenger train to and from Rubery was on 28 August 1960 when the Rubery Tenants’ Association ran a chartered excursion to Belle Vue, Manchester. When the railways were nationalised on 1 January 1948 the Halesowen Railway was allocated to British Railways (BR) Western Region, but in a boundary adjustment on 1 February 1958 it was transferred to London Midland Region administration. Private motor vehicle ownership rapidly expanded during the 1950s, and with demand for its train services declining BR announced that the workmen’s trains would be discontinued on 29 August 1958. Representations from Birmingham City Council over the issue of the withdrawal had a limited effect, with the Birmingham New Street to Longbridge being retained temporarily. So, on 29 August 1958, the final Longbridge to Old Hill service departed, with the Birmingham New Street services finally ending on 2 January 1960. The council placated inconvenienced passengers with the assurance that the ‘improvements in bus services adequate to cover the workers’ needs’. 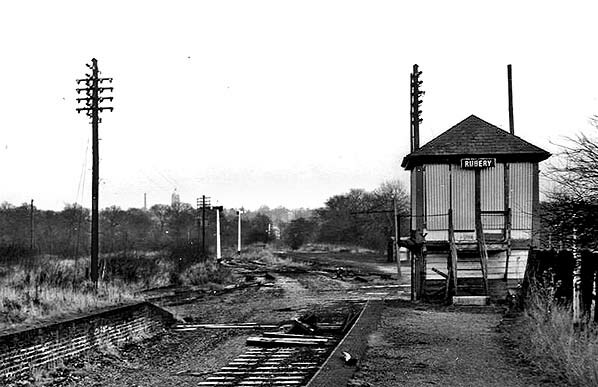 The line north of Rubery to Halesowen was closed on 6 January 1964, the final train having run on 4 January. The Rubery to Longbridge section lasted only another six months, being closed on Monday 6 July 1964. The line to a point north of Longbridge station was lifted with what has been described as ‘indecent haste’. 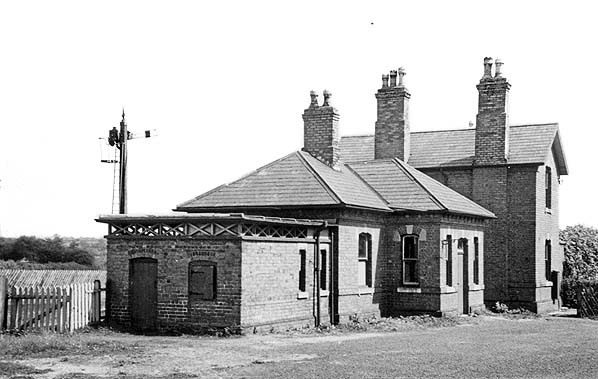 The station buildings and signal box were demolished sometime after February 1966, and the platforms were left for nature to take over until the early 1980s when the whole area was redeveloped as part of the Frankley Housing Project. Tickets from Michael Stewart and route map by Alan Young. The fine Midland Railway buiding at Rubery seen in May 1949 from the station forecourt even though the regular passenger service had ended some 30 years previously the tation was still staffed until the middle of the next decade. The 1903 six inch map shows the rural location of the station with the Rubery & Frankley Railway winding its way northwards. The close proximity of the City of Birmingham Lunatic Asylum (not quite politically correct) is apparent it was one of the places injured soldiers were transported to during the First World War. On the 1955 1:10,500 map there have been several changes in the station locality the quarry is now shown as the 'old quarry' and the Rubery & Frankley Railway branch has been long since lifted. 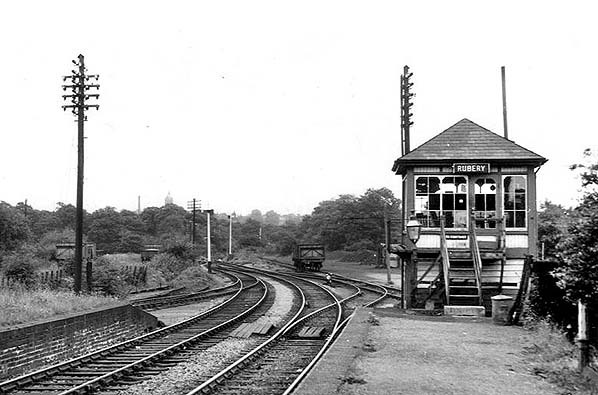 Looking east towards Longbridge in May 1949 with the down platform becoming a little overgrown and the unusual position for the starter signal being placed in the centre of the platform outside the waiting room exit. A view from the southern end of the station looking north-west during the mid 1950's with the signalman keeping a watchful eye on the track workers who are busy oiling the trailing points to the goods yard. The wooden signal post on the platform looks to have had a coat of paint since the 1949 view. 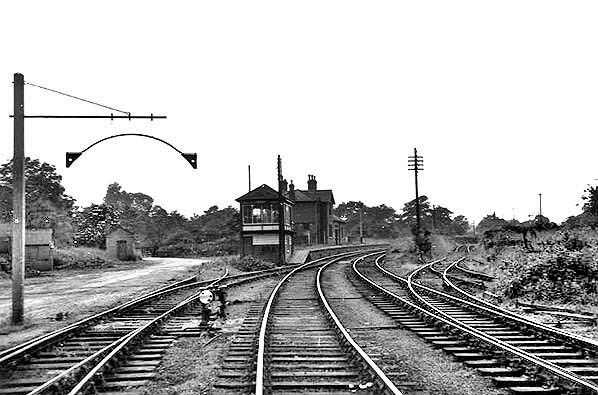 A wide view from the southern end of the station during July 1954 showing the pointwork the trailing connection to the right ran onto the Rubery and Frankley Railway which had been a lengthy branch up to the Frankley Reservoir and the Birmingham Corporation Water Works the sidings were still in use by the local quarry. 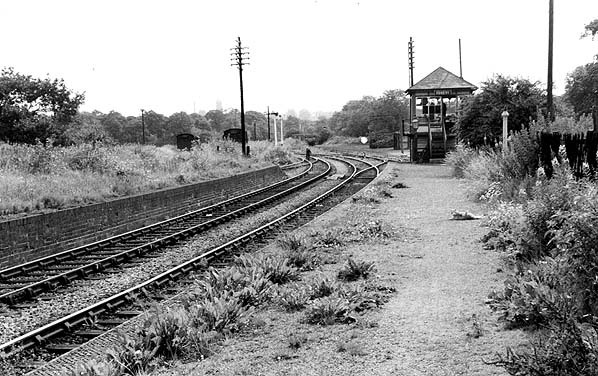 Looking east from the centre of the Halesowen bound platform in June 1956 from which the majority of the weeds have been removed suggesting that the workmen's trains continued to call here. The opposite platform is very much clogged with weeds. By the time this shot was taken in May 1958 the up platform opposite has been cleared and fresh gravel has been laid on both platforms. It is a mystery as to why this work was being carried out. Looking in the Longbridge direction during July 1962 with several mineral wagons in the yards either side of the line and the track looking well used. Looking from exactly the same point as the previous photograph in December 1964 by this point the line had ben closed for only 5 months and has been completely lifted. 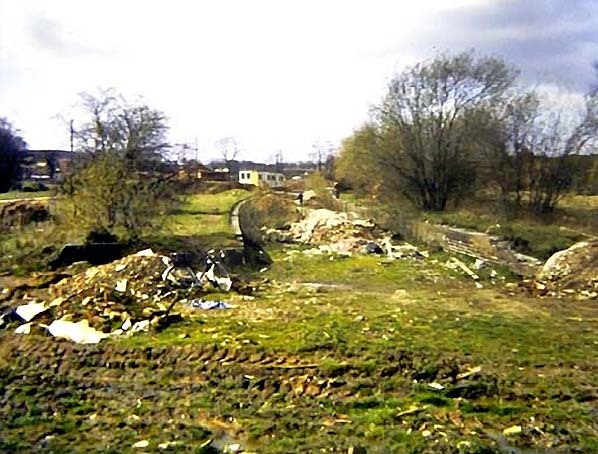 Looking towards Hunnington during 1977 at the remains of the platforms within a short period the Frankley housing project would obliterate nearly all traces of the station. The large conurbation that was built up here would have no rail access and their sole public transport option would be by bus. 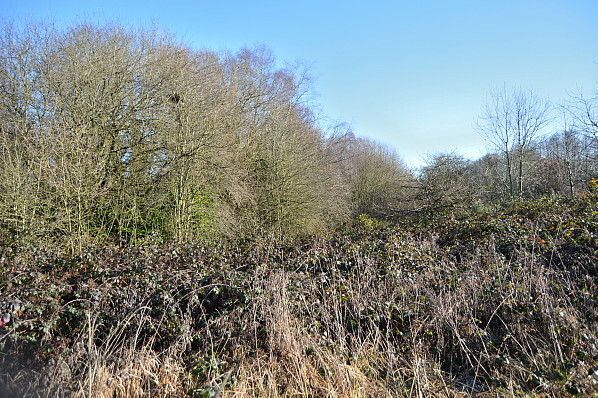 Looking east towards Longbridge on 28 December 2014 the station was located within the trees to the left of centre. After much searching in the wooded area a discernable raised area could be found with a gap wide enough to take two tracks before another visible mound. 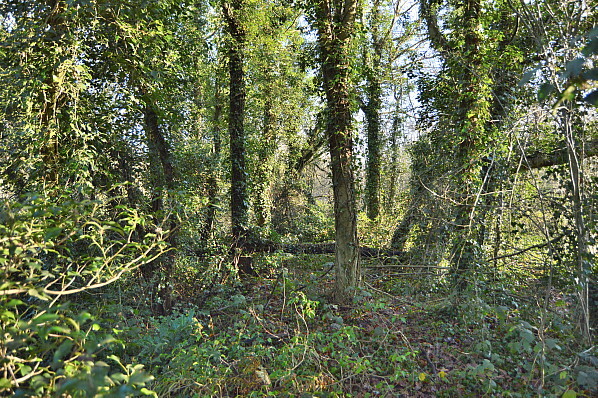 This is looking west towards Hunnington on 28 December 2014 from what is believed to be the down platform.